Using the PelvicToner couldn't be easier. All you need is somewhere comfortable and quiet and a 5 minutes to yourself. Follow the simple instructions and you can be exercising effectively within minutes of opening the box. A set of PelvicToner exercises only takes 5 mintues.We recommend that you do them every day, but at least 3 times a week as a minimum. If you find a regular time, for example, when you go to bed or first thing, you will find it easier to remember. Many women feel an improvement in their muscle response as soon as they begin to use their PelvicToner. It is a sure sign of progress that most women become more aware of their pelvic floor and vaginal muscles in a matter of days and more concrete improvements follow quickly. In a user survey 90% of women noted 'greater awareness' within one week and most PelvicToner users notice significant improvements their pelvic floor (vaginal muscle) strength in 2 to 3 weeks. In a user survey over 85% reported that their stress incontinence symptoms were 'much improved' in 4 weeks. The PelvicToner uses the key principles identified by Arnold Kegel and used in his "Kegel Exercises". First, it helps you identify and isolate your pelvic floor muscles, so you know you are working the right muscles. Then it helps you to exercise those muscles effectively by squeezing against a resistance provided by sets of springs. 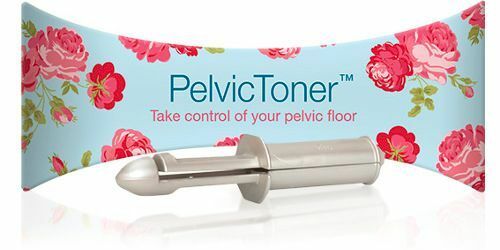 As your pelvic floor gets stronger, you the PelvicToner allows you to increase the resistance that you squeeze against to make your exercise more demanding. The more you squeeze, the stronger you get and the greater the benefits you experience.